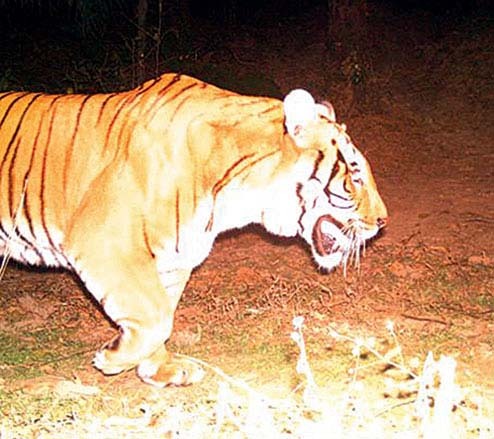 A camera trap set up at the Neora Valley National Park in Kalimpong has captured the image of a tiger on Monday, few days after a big cat was photographed in the same area. Foresters are yet to confirm if the pictures were of the same animal but officials said that the camera trap footage seems to be of a female tiger and it was older than the one seen last week. The photographs would be sent to the National Tiger Conservation Authority to know more details. "We have got a picture of a tiger from a trap camera and that is very good news. We are planning to set up more such cameras in the region and we hope to get more pictures soon. We are trying to keep a close watch on the animal and for its safety, we would not disclose where the picture was taken," said Sumita Ghatak, conservator of forest, wildlife, north Bengal. According to forest sources, the camera trap set up near Lava clicked the tiger's photograph at 8.27pm on January 23. On January 19, a driver ferrying four passengers from Pedong to Lava had spotted a tiger in Neora Valley and managed to click a picture on his cellphone camera. After that, four camera traps had been installed in and around Neora Valley to monitor possible movement of tigers. Today, foresters of Gorumara National Park asked for six camera traps from Jaldapara National Park. Sources said the devices would be installed in Neora forest over the next few days. "Within the next one month, we will set up at least 50 pairs of trap cameras in Neora Valley," Pradeep Vyas, the chief wildlife warden, told Metro over phone from Calcutta. Tigers are rarely seen in north Bengal.